Description: Suburban commuter F7's in weekend freight service parked in Proviso Yard 4, Wis. Div. Description: CNW Scoot passes under signal bridge. Description: Chicago & North Western Railway F7 at Western and Grand Avenues backing to the downtown station in Chicago, Illinois on an unknown day in October 1979, Kodachrome by Chuck Zeiler. Description: Chicago & North Western Railway F7 411 and a bunch of other trains waiting to enter the C&NW Station in Chicago, Illinois on May 12, 1983, photo by Chuck Zeiler. Also pictured are RTA F40PH's 147 and 136. These trains are waiting to back into the station as soon as trains already in the station depart. Judging by the signal displayed in the upper right of this frame, a train has been cleared for departure. Description: Chicago & North Western Railway F7 411 at Hubbard Street in Chicago, Illinois on May 12, 1983, Kodachrome by Chuck Zeiler. Description: FRESH out of the WSOR paint shop in Horicon...Where is this thing headed?!! Description: FRESH out of the WSOR paint shop in Horicon...Where is this thing headed?!!! 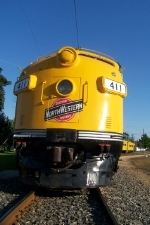 Description: CNW F7 411 makes its first public appearance at IRM since getting its new paint. Description: Restored F7A at IRM. Blt as Freight CNW 4082C 11/49. Repainted, regeared and Renumbered Passenger CNW 411 1971 (2nd unit to use this number). Sold to RTA (now Metra) 1977. Renumbered and repainted to METX 305. Restored by IRM Aug 2006. Description: The CN&W commuter set sits on the wye at the end of the Diesel Days event. Description: CNW F7 411 sits at the IRM depot with its matching Bi-Level train. Description: CNW F7 411 and BN U30C 5383, both wearing fresh paint, meet at the IRM depot. 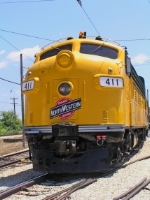 Description: CNW F7 411 sits at IRM waiting for its time to be in service. Description: Bilevel train has backed out of Yard 5 over the Car Line by Barn 2, headed to Station 1 to perform "after hours" at-speed runs for the annual Members Showcase, which is always a blast. Description: Backing out of Station 1 to the mainline, headed to Johnson Siding & back for "at speed" runbys. Description: Night shot during annual Members Showcase. Description: CB&Q E5A 9911-A and CNW F7A wait nose to nose for their next run on Station Track 2 at the Illinois Railway Museum. Description: CNW F7 411 leads the bi-level train.